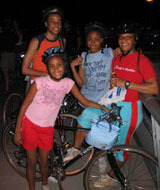 Join us on bicycles or skates at 10 p.m. on the last Saturday of every month at the Columbus Circle (59th Street) entrance to Central Park for a totally safe, magical, evening ride in Manhattan. From Columbus Circle we head west and then noodle our way north, exploring Riverside Park's bicycle-friendly pedpaths. Nearing the northernmost point on our ride, we pass Riverside Church and Grant's Tomb. Southbound, we ride the Hudson River Greenway enjoying grand vistas of the Hudson River. Many folks head home on the Greenway, but for those who want to return to our starting point, it's a pleasant ride on city streets back to Columbus Circle where the ride ends between midnight and 12:30am. This ride covers about 8-10 miles and lasts about 2 hours. Weather? We only cancel when no one in their right mind would have fun. Dress for the weather. We hope these rides encourage folks to enjoy our parks at night: quiet, safe, and relaxed.